Want to work flexible hours doing something already do naturally? Nice Talk is looking for English language tutors. This platform is China’s first mobile app that allows students to video chat with a fluent English speaker. Immersing yourself in a language and speaking it conversationally is the best way to learn a new language. That’s why Nice Talk created this app. Students and tutors can easily connect through video and have a conversation in English, allowing the student to immerse themselves in the language. First and foremost, you must be an English native speaker. Applicants with IELTS/TOEFL teaching experience or TEFL/TESOL/CELTA certification are preferred. Updated Android or iOS operating system. 7.0 iOS or 4.0 Android operating systems are necessary to run the app. A reliable, high-speed internet connection. Your connection must be consistently above 300kbps for uploads and 500kbps for downloads. A quiet, distraction-free work area so that you and your student can clearly hear and understand each other. The application process is simple. Register with your email address and record a short interview video so they can learn more about you and see your English language proficiency. You’ll need to apply and record your video with your mobile device. Visit Nice Talk’s website to download the app the follow the instructions to complete your application. Once approved, just use the app to “go online” and start taking tutoring requests whenever you’re available. You can choose your own hours. Random Call Mode – you will be matched to a student based on your ratings and availability. Direct call will allow you to work with specific students again and again at set times and random call will allow you to work with a variety of students depending on your changing availability. How Much Does Nice Talk Pay? When conversing with a student, you are paid for each full minute you are online with them. Payment is through PayPal so you’ll need a verified account. Pay comes out to $10 per hour. Nice Talk sends out payments every week, as long as you’ve earned at least $20 in that week. If you earned less, your payment will be held until you earn at least $20 then sent. If you’re interested in learning more or getting started with the application process, visit Nice Talk and download the app, then simply follow the app instructions to apply. 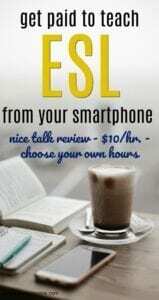 If you have a bachelor’s degree there are some other ESL tutoring jobs that pay more that you may be interested in. VIPKid– This company starts teachers out at up to $22/hr. Must have a bachelor’s degree in any subject. Curriculum provided. Magic Ears – Magic Ears teachers start out at $18-$26 per hour with room to grow. Must have bachelor’s degree in any subject. Curriculum provided.